I love makeup. And though there are certain things that I don't mind splurging on (say a makeup palette that I really want), other times I want to save my money. And honestly- the idea that you have sto spend a ton of money to get high quality makeup is a myth. Some of the best products I have ever used have come from the drugstore or from an affordable brand. And these days, companies are taking notice of what is popular and coming up with their own comparable yet more affordable versions. 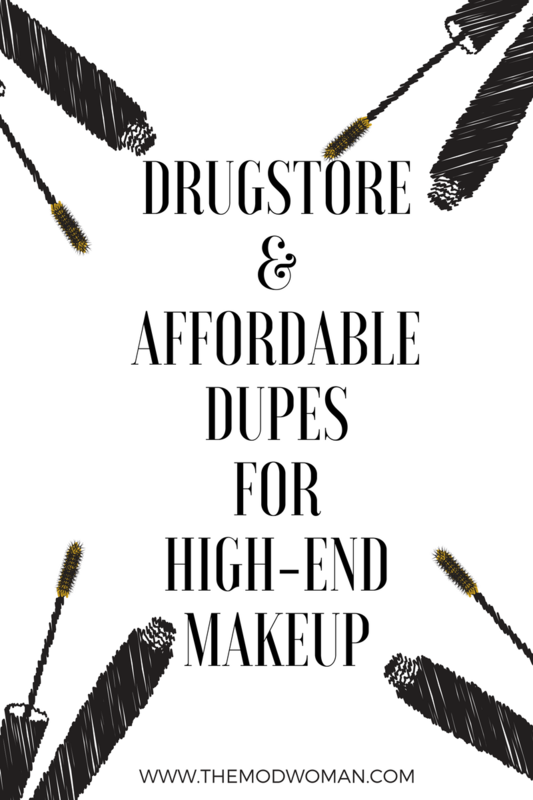 Below are some popular high end products and their more affordable dupes. I spoke about both of these primers in my favorite makeup products of 2017 post. If you have oily skin both of these are amazing at helping keep your makeup on all day. And as you can see there is a significant price difference. But the formulas are very very similar. I would say that NYX Angel Veil is a tad thicker and creamier in consistency. Having used both I do love Hourglass Mineral Veil just a tad more. I like the lighter feel of it. But honestly - you would be hard pressed to tell the difference if you used both. So save your coins and go for NYX. I use both of these foundations. I switch between them often during my work week. And they both perform pretty identically. I use my Revlon ColorStay a tad more often because it's more affordable and easier to replace when I run out. I also like the ease of using - ColorStay comes with a pump. Estee Lauder Double Wear does not. But that's truly my only gripe about it. Shade-wise Double Wear is a better match for me but both ranges have a health shade range - Double Wear has 38 shades and Revlon has 22. My gripe with Revlon's shade range is there are huge gaps between their medium- deep to deep shades. I am 370 Toast. The next shade up is 375 Toffee and it's about 2 full shades too dark for me. If you are looking for a high-end full coverage foundation that can withstand high temps, oil & sweat? Double Wear is your girl (trust me- I wore it in 80 degree temps last summer and it didn't budge!). If you are on a tight budget? Go with ColorStay, it's a great alternative. Unless you've been living under a rock, you know that Tarte Shape tape took the amkeup world by storm when it was released a little over a year ago. It is the concealer that all other concealers are compared to. And it has a hefty $27 price tag to go along with it's stellar reputation. I for one simply couln't imaging spending almost $30 on a concealer. I kept adding it to my cart and then taking out. I just couldn't do it. And then ColourPop came out with their own range of conealers, the ColourPop No Filter Concealer and all was right with the world. I love this concealer. It is pigmented creamey - but not to creamy and dries down to a nice matte finish. I use it for covering blemishes and as my eyeshadow base. Laura MercierTranslucent Setting Powder is a holy grail item for many makeup enthusiasts, influencers and makeup artists. It works for all skin tips, isn't heavy or cakey, and gives a beautiful airbrushed finish to the skin. It's also $38. 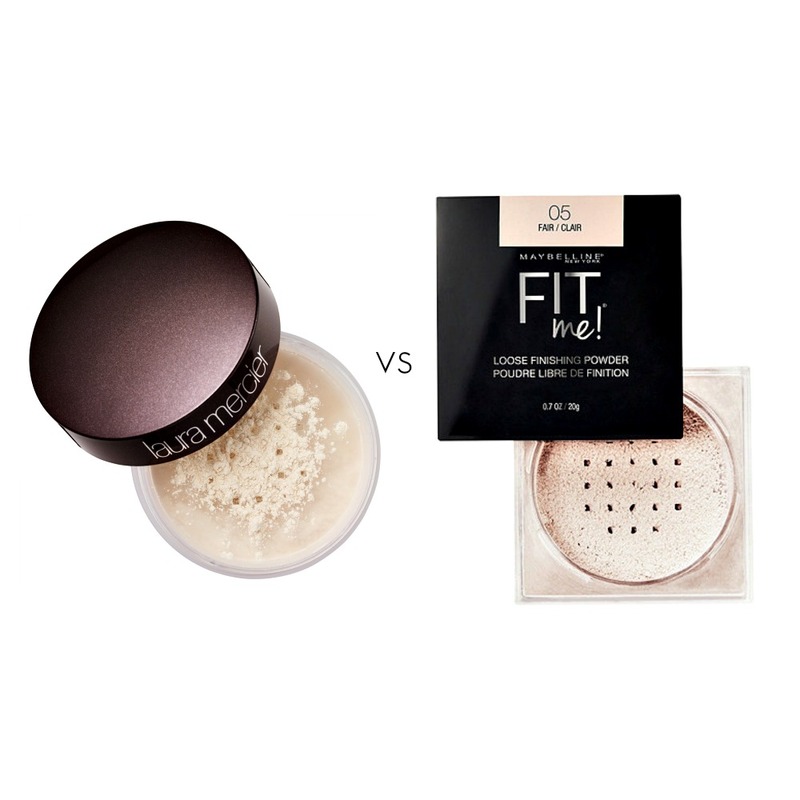 Maybelline Fit Me Loose Finishing Powder comes in a variety of sheer tints meant to match your skin (and avoid the ghost or mask look that some translucent powders can give the skin), isn't heavy or cakey and gives the skin an airbrushed finish. It costs $7.99. This drugstore powder has become so popular that it's raved about by beauty influencers as an affordable dupe for Mercier. Though these powders are similar - they are not the same. But they are pretty damn close. Yep, you read that right. The Natasha Denona Sunset Palette costs $129. I will give you a second to pick your jaw up off the floor. I am an eye shadow palette junkie. I love them and I love collecting them. But there is just no way I could justify spending that amount of money on an eye shadow palette. Natasha Denona is well known in the beauty world and her eye shadow formulas are amazing. But $129 worth of amazing? That's been up for debate. Unless the palette will apply my eye makeup for me and do my laundry as well it's simply not worth the money for me. But in the makeup world you don't have to wait long for someone to dupe a high end palette. The ColourPop Yes, Please Palette was released late last summer and it was a major hit. It was such a big hit that it took me three tries to purchase it because it kept selling out. This palette was in my favorite makeup products of 2017 post. It has become a go-to for me. The formulas is fantastic: the colors are pigmented, blend easily and look good on every skin tone. And the palette costs $16! Save your coins and grab this palette. I had been wanting to try the Clarins Instant Light Lip Comfort Oil for some time. Everyone raves about it. But the $26 price tag kept scaring me off. And the I came across Milani Moisture Lock Lip Oil and it's $8 price tag. I have been using this for about a month and I really like it. I use it before bed as my overnight lip treatment and my lips are smooth and hydrated in the morning. The consistency is a tad thicker than the Clarins lip oil, but it's a small sacrifice to save a bit of cash.